shot in the knee by an armed gunman in grocery robbery. 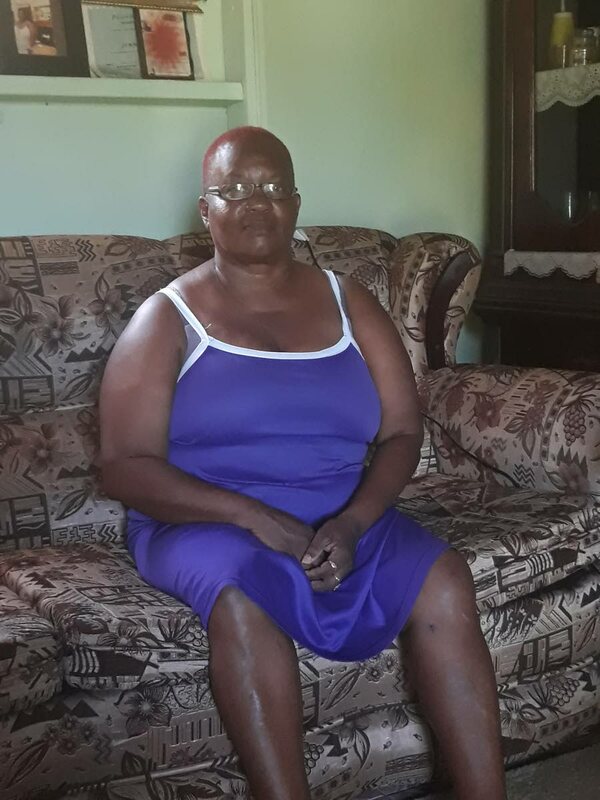 At 52, Jenne Douglas of Black Rock, Old Grafton Road, has faced and overcome many struggles in her life, from being abandoned at eight months old by her mother to losing her first and only child at the age of 14. But all her experiences pale in comparison to the pain and suffering, not to mention trauma, she suffered when she was shot in the knee in 2016 by a bandit during a robbery at the grocery where she was the cashier. Today, though she sees her existence as more than a second chance in life, and is happy to be alive, Douglas still struggles with trying to find peace in Tobago, haunted by a daily fear that the robbers will return, especially as the anniversary of the robbery approaches on December 9. “I live by myself and I used to be frightened thinking this thing could happen again. It made me put on extra locks on my door; it’s really not a nice way to live. I never believed in all my years I would go through this kind of trauma ,because I am originally from Trinidad and there is where you expect to get shot, but not to come to Tobago to get shot,” she said. She said reports of shooting, especially in her area, always leave her shaken. “They never caught the person who did this to me so it’s hard,” she said. “It’s slowly but surely getting out of hand. When I came to Tobago, there were only two to three murders a year, now it's nine murders, most from gun violence." In an interview with Newsday Tobago last week, Douglas recounted the horror of being held up by two bandits, one armed with a gun, and being shot. On that Thursday, she was at the supermarket on the Black Rock Main Road around 5 pm when two masked men announced a holdup. “I was cashing and there was one customer in the supermarket. That customer is one customer we know and once the place is about to close, he would want so many different things. He finally asked for a half-pack of cigarette and a paper. "As I was about to give him the paper, I saw two masked men, covered from head to toe, in front of me, one holding a gun. They told me to give them the money,” she recalled. Douglas said she was in such shock, she could not open the cash register. The robbers became angry. “The one without the gun snatched my gold chain and he snatched the customer’s gold chain and took over $200 from him. Before they left they shot me in my foot,” she said. “When I turned around and saw them (at the cash register) my only thought was that this was not happening. I heard about this happening, but I never went through anything like it, so it was a very scary experience. After I got shot I panicked and the ambulance seemed like they were taking forever to come, although they came quick, but because I was in so much pain, time seemed like it was moving slow. “I saw my life flash before my eyes. But all I could think is, God has a plan...because they could have killed me, the gunman could have shot at my head or somewhere closer than my foot. People outside the grocery were saying men were coming back. The only thing they were coming back to do was to kill me because they got no money. It was the taller guy without the gun who pulled the gunman back to leave,” she said. Douglas was taken to the Scarborough General Hospital, where an MRI scan showed her shin bone was cracked and her knee shattered by the bullet. She spent 12 days in hospital. To add to this trauma, Douglas said police investigators have never updated her, have held no one for the shooting, and added insult to injury when she tried to get a police report for her NIS claim. “Even in the hospital, there were two investigators, a man and a woman, and they kept me up till 1am. After they took the information, I never got an update on the case. I made calls and when I needed to get a police report for NIS, I got a run around. When I eventually got the report from the Old Grange police station, it was only four to five lines with wrong information that I was told was unfixable. I asked if that was all to the report, and the corporal at the station told me try with it because I’m getting it free,” she said. Now, to deal with her trauma, Douglas gives thanks and praise to God, recounting days without money, having to use a walker, and then months without a job, and with rent to pay. God has revealed himself to be her provider, she said. “I have bills to pay and no job, no husband support or from children. My former employer wasn’t even paying my NIS, and he rarely visited me in the hospital, but God has been so good to me that friends, in Trinidad and the Church of Nazarene in Tobago, assisted me with three months’ rent. A brother assisted me with rent up until September and now I’m behind on my rent, but beside that God has supplied,” she said. Reply to "Shot in knee, victim lives in fear of bandits’ return"